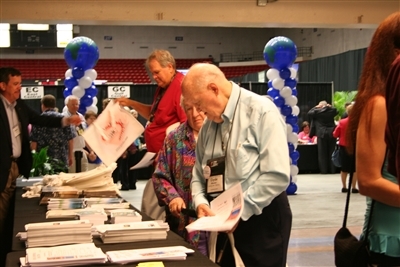 Annual Conference opens with a bustling Ministry Expo, which remains open Thursday and Friday, June 12-13. Photo by Cindy Skop. LAKELAND -- Standing in front of a giant world map, Melva Walker's hands do the talking as she helps Dorothy Schulz find Puerto Rico. Walker is one of several sign language interpreters for the deaf at the 2014 Annual Florida Conference held June 11-14 at The Lakeland Center. This is her fifth year as a volunteer. "It's wonderful," says Walker, who is a member of Waukeenah UMC, Monticello. "I believe that any ministry where you feel it in your heart, you're drawn to do it. I love deaf people and sign language." Schulz, from Conway UMC, Orlando, is attending Annual Conference for the first time. She came Ron Page, also a deaf member of the church. Page was joined Wednesday by his service dog, Jedi. Schulz and her husband moved from her native Michigan to be near her daughter. She is planning a vacation trip to Puerto Rico in the fall. "We're having fun just getting free stuff," says Schulz, who pedals four miles on her bicycle to attend church services. Her daughter helped her find a church that provided a deaf interpreter. 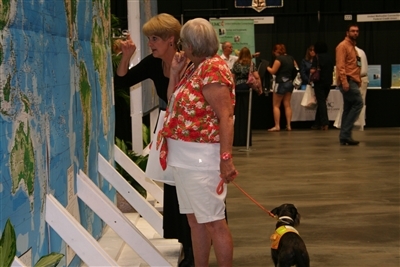 Melva Walker helps Dorothy Schulz, foreground, locate a destination on a world map at Ministry Expo. Photo by Susan Green. 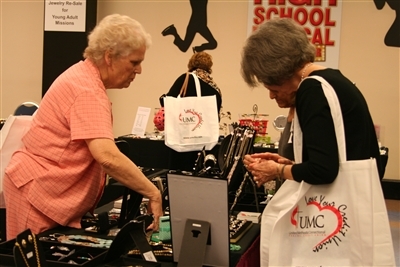 Conference attendees support mission trips for young adults by buying jewelry donated from Methodists throughout Florida. Photo by Susan Green. 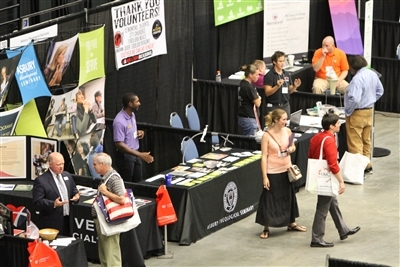 On Wednesday, delegates to the conference began arriving at 8 a.m. to check in and stroll past displays in Ministry Expo. Some settled into comfy chairs and sofas in the expo’s gathering area to catch up with old friends they haven't seen since last year's conference or to make new friends. Opportunities to donate to missions abound. Church members from First UMC, Lakeland, staffed a display booth for Our Giving Tree Bookstore and Gift Shop, which raises funds for various missions. Jewelry, beauty products and coffee are among items for sale. In the last four years, Our Giving Tree has collected about $3,500 for missions, including the Beacon of Hope, which helps women in Kenya who have HIV/AIDS. Funds also have supported local summer food programs, children's clothing giveaways and the Talbot House Ministries. Church member Carol Marsh says items like coffee are sold at "fair-trade" prices. People who buy items get brochures "to let them know it's not just a gift, but it supports missions." Just outside Ministry Expo, a temporary jewelry store was set up to sell baubles that will generate money for young adult mission trips. Thousands of pieces of donated jewelry were spread over several tables, everything from costume to vintage necklaces, pins, rings and bracelets. Rev. Pam Carter, wife of Bishop Ken Carter, spearheaded the collection drive, and district offices across the Florida Conference reported being deluged with donations. Sales will continue Thursday and Friday. South Shore UMC, Riverview, donated more than 620 pieces of jewelry. "We just keep pulling out more," says Kathi Sheehan, South Shore’s adult discipleship director. "There's tons more." Walker says she couldn't resist and bought $75 worth of trinkets. Annual Conference members check out materials at the welcome table. Photo by Susan Green. Dozens of people checked out about 1,200 book titles, as well as other products, for sale by Cokesbury, the leading national retailer for Christian products and services. Pastor Owen Stricklin of First UMC, Deland, was scouring the book stacks for the latest publication by Steve Harper, "For the Sake of the Bride: Restoring the Church to Her Intended Beauty." The books and other resources help pastors, congregations and individuals to keep up with what's happening right now in The United Methodist Church, Stricklin says. "That's really what I'm looking for. You're always looking for resources." There are books on a variety of subjects including church leadership, Bible study, theology, Christian education, church songs and preaching worship. One table is devoted to books recommended by the bishop. Beyond the book stacks, Stricklin has another purpose that has drawn him to the conference for 27 years. 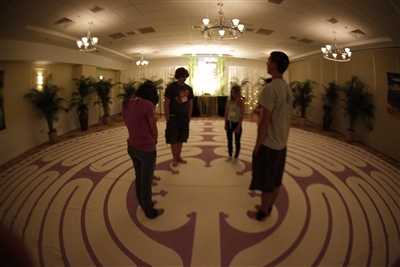 Visitors to the Annual Conference Prayer Garden in Lake Hollingsworth Room B use the labyrinth to facilitate reflection. Photo by Cindy Skop. "It's to me a re-connection to know you're not alone, and you are supported by all the churches around you," he says. Sue and Rida Rishmawi are back this year with their Bethlehem Christian Families booth, selling hand-carved religious figurines made from wood of the olive tree. New this year is the Last Supper and a large creche. The olive art is made by Christian families in the Holy Land, says Sue Rishmawi. "Every year comes new stuff," she says. "It's a good conference." Mission work is Erica Oliveira's passion. She is in the last year of a three-year program that took her first to Ukraine and currently to Miami. In a heartbeat she would go back to Ukraine. "I've been lucky in my life," the 26-year-old says. "God has opened doors. I'm waiting." At the conference, Oliveira watches over a display for Mission: Layover for the South East District. As the program's coordinator, she is specifically hoping to find young recruits ready for mission work. There are international and national opportunities, she says. "Young people want to get out and do big work, great work in togetherness with God."